Bet on charts and become a Music-Tipster! 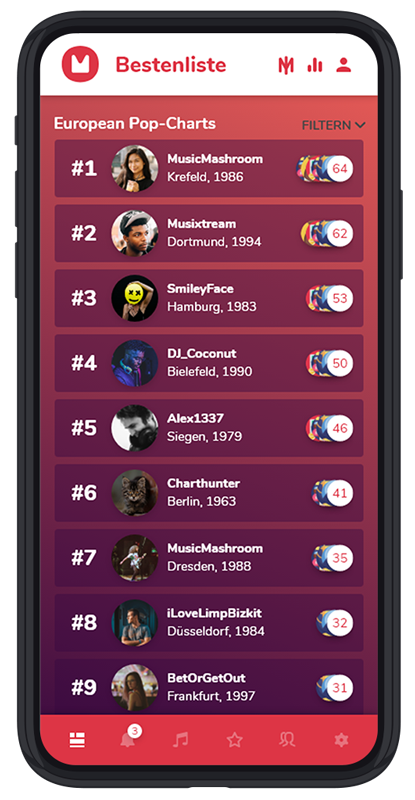 Ever­yo­ne will always come to you for the next hot music tip!? Then you’re exac­t­ly right here! With your fee­ling for the next chart suc­cess or flop, you will earn our own cryp­to­cur­ren­cy: the Mudo. 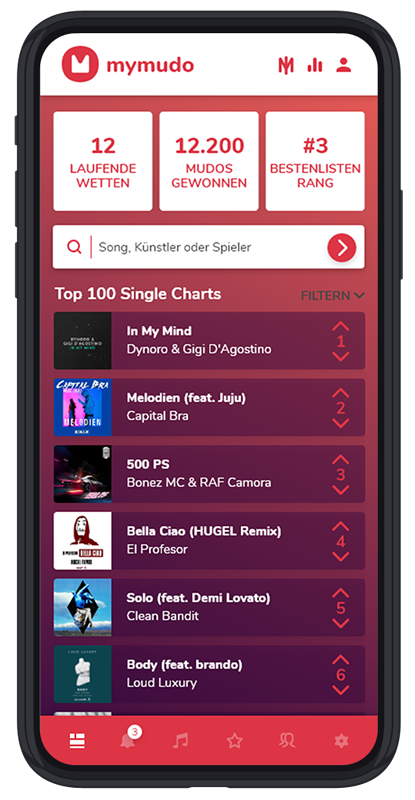 Be the first to know which songs are being hyped and find the next insi­der tip in the charts! 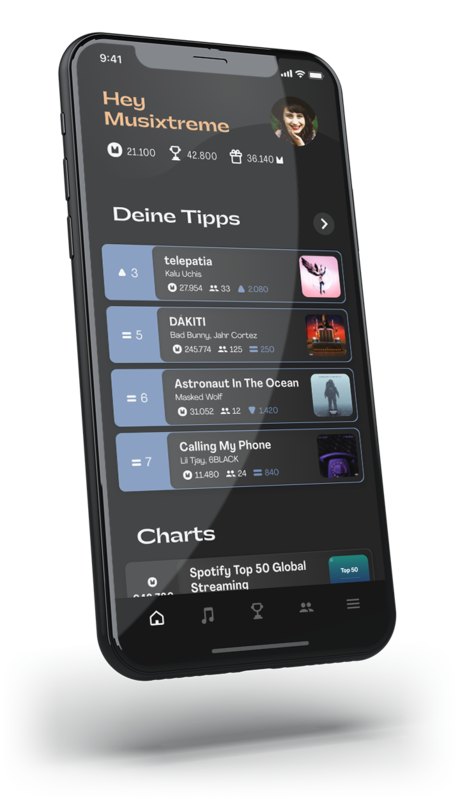 Lis­ten to chart music direc­t­ly from us! Find all infor­ma­ti­on about the artists and bet on it! Mea­su­re your music sen­se with others, collect achie­ve­ments in the charts and impro­ve your ran­king! What awaits you with mymudo? 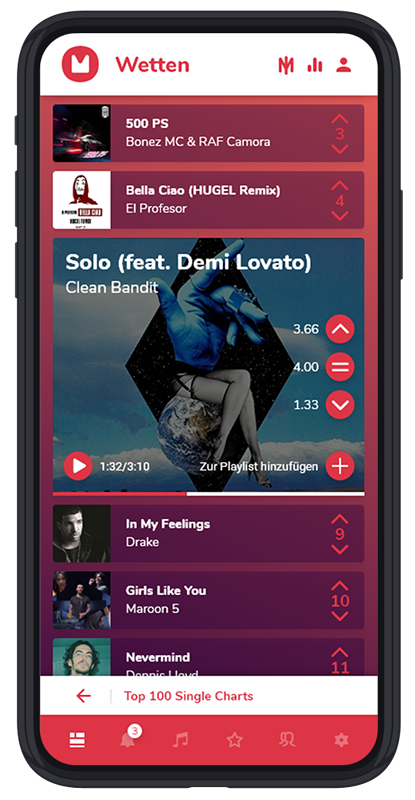 “Music is my first love” — with mymu­do you get the chan­ce to dive deep into the music world. Our odds are based on the cur­rent inte­rest in artists and songs on the web. Are you sure what the next insi­der tip is? 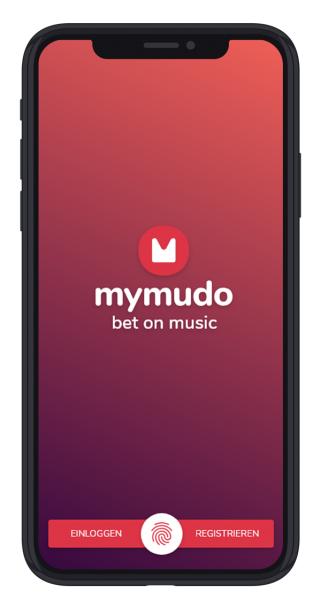 Bet with mymu­do! Public reco­gni­ti­on — With our ran­king sys­tem, ever­yo­ne can see how well you can anti­ci­pa­te the next chart suc­cess. 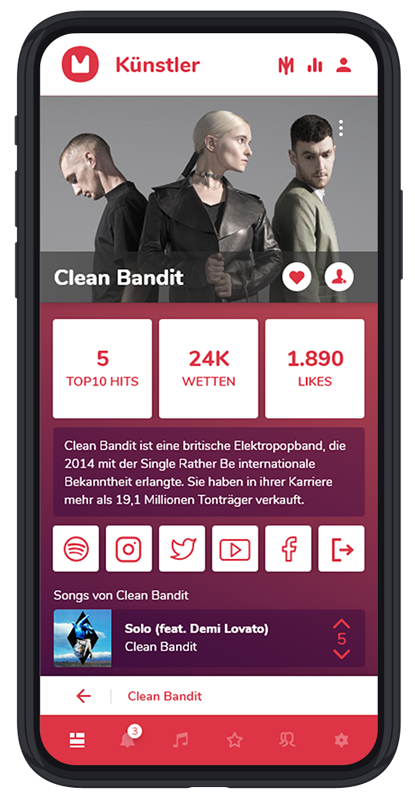 You are the next music tips­ter! Cryp­to game cur­ren­cy — The Mudo is the cur­ren­cy in mymu­do: Trans­form your music fee­ling into our cryp­to­cur­ren­cy! 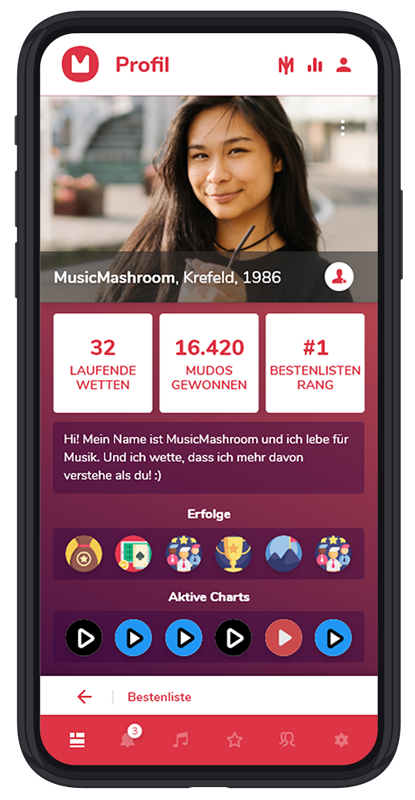 Talent Sup­port — mymu­do invests parts of the pro­fits in a talent fund: Sup­port the future of music! We develop together with you! mymu­do wants to be estab­lished and expan­ded with the help of its users and inte­rested par­ties. The­re­fo­re your opi­ni­on, your know­ledge and your idea is very important to us. Use our crowd­sour­cing blog and give us feed­back direc­t­ly! Fan of the first hour? Get involved! mymu­do is gro­wing and we work every day to land with the mymu­do app on your smart­pho­ne. Beco­me a “fan of the first hour”, get the bene­fits of being one of the first users and stay up to date on the pro­gress of mymu­do: Sign up for our news­let­ter! 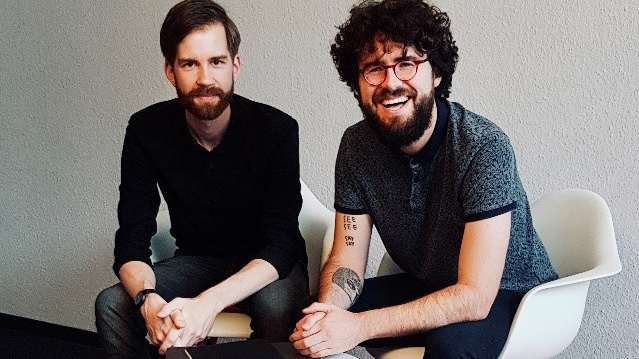 mymu­do is a start­up from Düs­sel­dorf and Kre­feld on the Lower Rhi­ne, foun­ded by Dani­el and Chris­ti­an. We bring a new toy to the music indus­try: bet­ting on music charts. Our big­gest moti­va­ti­on is to build an app for you that exci­tes and con­nec­ts peop­le. Inte­rested in the minds behind the start­up? mymudo supports musicians with the talent fund! We want to invest a part of our pro­fits in a fund that bene­fits pro­mi­sing musi­ci­ans who are still at the begin­ning of their care­ers! Your feed­back, ques­ti­ons and ide­as are par­ti­cu­lar­ly important to us. We gua­ran­tee you an honest ans­wer and look for­ward to hea­ring from you!